Join me on September 8-9, 2018, in Charlottesville, VA, where I will be offering the NEW TFT Diagnostic level training. This 2-day live course includes the latest and newest TFT protocols that have been tested over the last few years and found to be extremely effective… allowing us to get more rapid results and reach deeper levels of challenges. This will be an exciting course and It meets the pre-requisite for our Optimal Health class, the top level of TFT training. This is your opportunity to get hands-on training in Callahan Techniques® Thought Field Therapy®. Another, very powerful procedure you will learn is how to help cravings and addictive urges, even obsessive negative behaviors. In fact, these procedures are so effective, top weight loss and addiction professionals use them as the basis or part of their best-selling programs. This training allows you to diagnose, i.e., determine the precise sequence of tapping required, to quickly help most psychological problems and daily stresses. The 2-day live course is limited to 18 people, to allow for hands-on training. Thought Field Therapy® (TFT) is gaining worldwide attention at an ever-increasing rate. Dr. Callahan’s book, Tapping the Healer Within, is now available in Danish, Norwegian, Japanese, French, Chinese, Korean, Spanish, Arabic Russian, and, also in the United Kingdom in paperback. TFT is reaching a worldwide audience. The results TFT achieves for our readers are positively astounding. There is an ever-increasing demand to learn TFT at all levels. 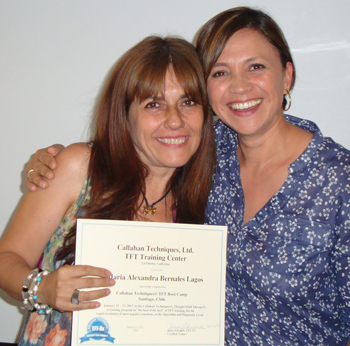 This is your opportunity to get hands-on training with Callahan Techniques® Thought Field Therapy®. Be a part of a rapidly growing international group healing the world with TFT Meridian Tapping.